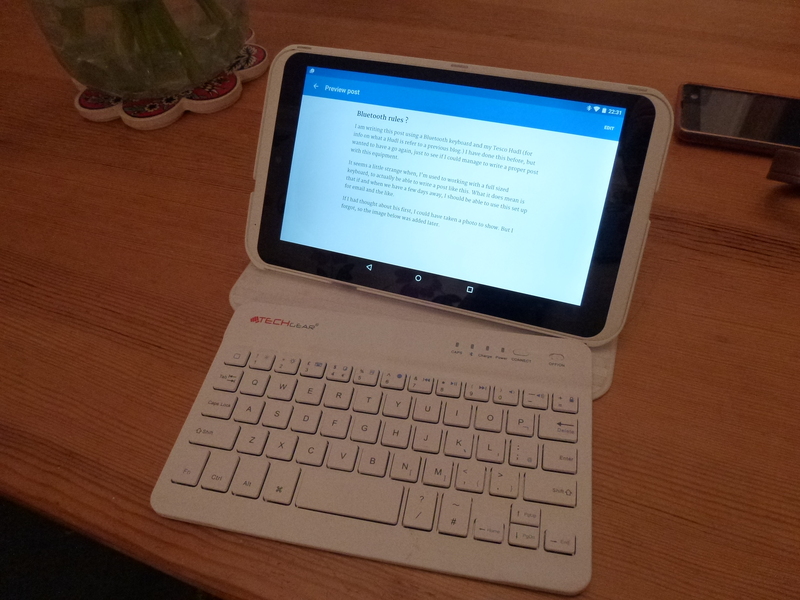 I am writing this post using a Bluetooth keyboard and my Tesco Hudl (for info on what a Hudl is refer to a previous blog.) I have done this before, but wanted to have a go again, just to see if I could manage to write a proper post with this equipment. It seems a little strange when, I’m used to working with a full sized keyboard, to actually be able to write a post like this. What it does mean is that if and when we have a few days away, I should be able to use this set up for email and the like. If I had thought about his first, I could have taken a photo to show. But I forgot, so the image below was added later. Eldest to here yesterday, for the local music gig. I thought, when we got there, that it was going to be a bit of a flop. There was just very few people there !! However, it picked up around 09:00pm, and it turned out to be a good night. Although, the headline act did not turn up, and did not let the organiser know. Not good ! Lost of jobs to do today, in preparation for our holiday. We go tomorrow, and are back next Sunday. Youngest is not that happy about going, but fingers crossed it will be okay. He went out with his support worker today, and that seemed to go well, so who knows. It would appear that England won by the skin of Japans teeth !!! This does not bode well, for when the real football starts !!! Have I wasted a £1.00 on my England aerial ‘bobble’ ???? I downloaded an album for Amazon today, which took me back a few years. I have no idea, what made me think of them, but at one time, they were my favourite band. A band from the 70’s called Be Bop Deluxe. Really did bring back memories of seeing them in the local pub, before they hit the big time. I remember buying their first album, Axe Victim, and playing it night and day. It still sounds good today, although that could be just me. May get chance to blog by email during the week (if I remember how) on my mobile. Just don’t hold your breath! The rest of Sunday went quite well. Youngest came back in a good mood. It sounds like he had had a good time. Eldest called, but I’m not sure he knew what day it was. Tried to ring Mrs H, but forgot she was working. Then it was work !!!!! D*** is on holiday for a week, so it was up to K**** to cover some of his work. It’s not fair really, as P*** is the supervisor, and it should be him that runs the show. Still K**** is the better of the two. It’s just a shame she does not get paid for what she does. Still having some issues with some of the routines and procedures. Certain people, think they know what they are doing. I think they are beginning to realise that they know a lot less than they thought. It was a busy day though. There was a lot of jobs to get through, but I got my head down, and they all got done. I don’t think G***, my colleague that sits opposite me was too happy with me. Lots of tuts and sighing. But there are times when I just need to crack on, and chatting over the desktop is not a priority. No doubt she will have a moan to the boss about it. Mrs H talked to S**** tonight. She tried chatting on MSN, but he was not answering. I think he was using his mobile to connect, and it does not always show when someone comes online. Anyway, I texted him to say she wanted to chat, and he said she could ring. From what I could make out, he did not get up until 06:00pm, and was just making some food at 10:00pm !!! Mrs H did not look pleased. He does not make it easy !!! Now, the question is …… do I go to the quiz-night tomorrow ??? Sometimes, I think I’m expected, then other times, I feel like a spare part. I’ll not decide until the last moment, but I’ll be out on Wednesday night (drama group), and may be out on Saturday (? ), and definitely out on Sunday, so who knows . Today went pretty much as expected. I managed to get nine PDA’s installed and back into service. So I’m the hero of the day again. Then to top it all the remaining thirteen PDA’s came back from repair. I’ll put another seven into service tomorrow, which should mean more praise. If only I took it serious. I must get those renewals done tomorrow though. It’s getting urgent now. We got to talk to S**** on Skype tonight. The video and audio was not brilliant, but that could be down to a number of things. Connection, network speed etc, etc. I’ll do a Google and see what it comes up with. I think though, that it could be my PC and the processor speed. We also tried a video call with messenger, but that was just the same as last time. I think Mrs H expects it to be a lot better than it is. Only one contact on tonight (at the moment), although N*** is probably hidden. R*** has been remarkably calm tonight (fingers and things crossed). He kicked off a little first thing, but that may have been leftover from last night. Mrs H said he did not have his medication this morning. He did not need it, so only two doses all day. We thought he was going off earlier this evening, but it came to nothing at all, and he seems very content at the moment. Mind you we have had this before. Little devil lulls you into a false sense of security then bang !!! and all the theories go out the window. I played at being Captain Stupid tonight !!!! We were watching Who Wants To Be A Millionaire, and the viewer question came up. I quickly noted the number and the answer down. Pulled out my PAYG phone and texted the answer. Three minutes later, the acknowledgement came back. It was then that I realised, that we were watching a recording from yesterday !!!!! Thankfully, it would appear that I only paid a standard text message charge, not the usual £1.00 entry charge. Oh, remember me saying that the biog I’m reading did not have any endnotes ? Well it has !! Lots of them, but unusually none of those irritating subscript numbers embedded in the text. I always feel I should look to see what the note is. It is then so frustrating, when the note refers you to another book !!! I finally worked out how to update Twitter from my phone. It would appear, that I have to use the mobile web version. Otherwise I pay 15p each update if I use a Twitter app. Now, go on, ask me how often I’ll use it. Well about as often as I use facebook on my mobile, about four times a week !!! But still it’s there when I want it. Well we got the new TV today. Looks quite good and the picture is great. We have had to move the screen around a little so it does not block out any more light, but it is quite watchable in its current position. We have been trying to get S****s surround sound to work. It has been partly successful. We can get the theatre sound with the DVD, and with the analogue TV channels ie the Freeview, but we have not had any luck with Sky system. I think it may be something to do with the way the SCART cables are plugged in. May have to have juggle them round a bit. New mobile seems quite good. It has been a bit of a struggle to connect via bluetooth. The PC suite is not the most intuitive, but I can always connect by the USB cable. There is a lot to learn though. I still have to work out how I can get my old ringtones onto the new phone. I also need to know how to get access to the applications that appear to be on the thing.